Every bride has a unique sense of style. Something that makes them… well, them. And if you’re the type of bride who loves details, but only in very measured quantities, we have the perfect selection of wedding pins for your big day. These wedding pins are far from ordinary. 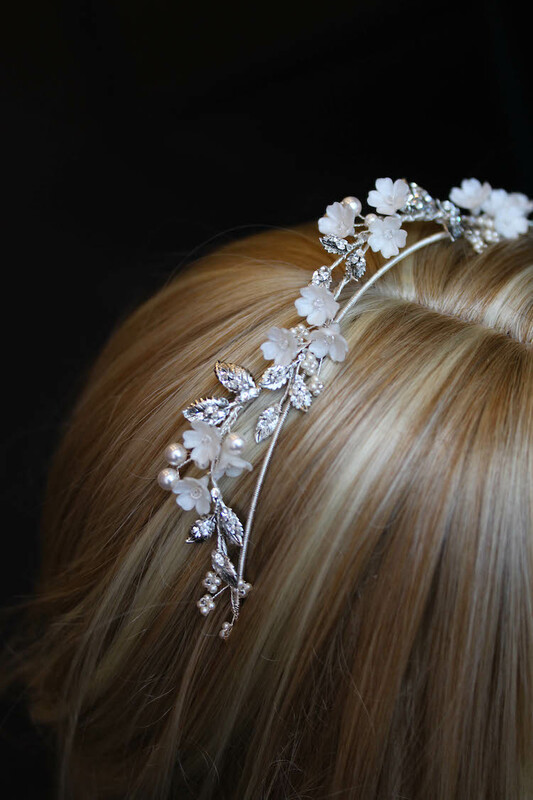 Reminiscent of a freshly picked posy of flowers, they feature elegant handmade flowers, Swarovski crystal details and antique gold and silver jewellery wire. While they may be small, they certainly hold their own and look beautiful either styled alone or with a veil. The Tearose blush wedding hair pin features pale rose and peachy tones that adds the perfect touch of warmth to a romantic bridal look. Perfect for romantic tendrils nonchalanty escaping from a soft bun, the Tearose hair pin feels beautifully fragile yet classically elegant. We love the Tearose pin with untamed updos and half up down hairstyles. Deconstructed French twists or a side chignon with the hair pin placed slightly to the side creates a look that’s infinitely classic with ultra feminine appeal. For a beyond beautiful look, style the Tearose hair pin with a statement long veil – the AUDREY or ROSELLA veil. Or, for a look that’s next level, style it with the ETOILE or MARGAUX crystal veil. The Maybelle floral hair pin is a beautifully uncomplicated and compact piece. A miniature bouquet of flowers featuring a touch of ‘something blue’ through it’s imperial blue crystal details that spray from beneath a perfectly formed clay rose. Style the Maybelle hair pin with small pearl or crystal earrings – our favourites are the BELLA, LOURDES and MONTAGUE earrings. If you’re planning to wear a veil, Maybelle is designed to sit perfectly to the side of the veil and creates a beautiful yet subtle focal. These classic and pretty pieces are a sweet serendipity of shimmering pearls, clear crystals and life-like flower buds. The Briar-Rose hair pins offer a simplified beauty like no other and also flexibility with styling. Style these pins alongside a loose and undone bridal updo or scatter them along half up styles for a more relaxed look. We love the Briar-Rose positioned to the side of the BLAIR fingertip veil, the ROSELLA or DAHLIA chapel length veils. True to its name, the Mignon is petite, dainty and oh-so-pretty. It’s the perfect piece if understated and refined elegance is more your style. The Mignon was designed to add a delicate point of interest to romantic low set updos. Wear it alone or as a set of two or three, the Mignon perfectly frames a bridal chignon with ultra feminine appeal. We love to style it with the LOURDES and MONTAGUE earrings for an effortless and classic look. 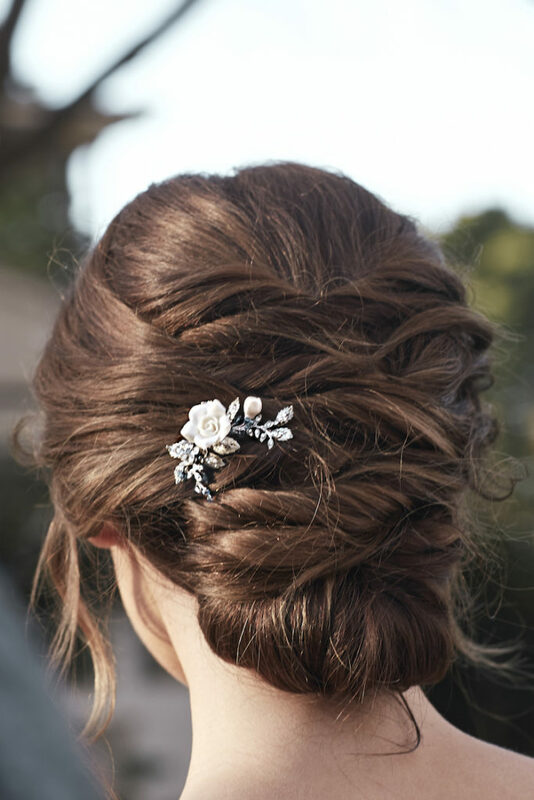 The Laura wedding hair pieces offer romantic and whimsical styling with minimal effort. Featuring the perfect blend of Swarovski pearls and crystal details, these simple yet dainty hair pins are what timeless beauty is all about. We love to style the Laura pins with equally clean and delicate earrings. Our favourite earrings to pair with Laura are the BELLA and MONTAGUE sets. When it comes to veils, we think the BLAIR fingertip veil or the WYNTER, or ROSELLA veils are a perfect match.